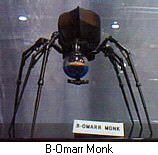 Linda Baker of Hasbro/Kenner has asked us to let you know that the B'omarr Monk figure offer has been altered slightly. For a variety of fairly obvious reasons, the offer will now be limited to 50 figures per household. Now, 50 figures is still a whole heck of a lot so we figure this shouldn't affect the vast majority of collectors. I mean, how many spider droids do you really need to protect Jabba's palace? After several unsuccessfull atempts to come to terms, Toy Biz Inc. announced yesterday that it has proposed a plan for the combination of its business with Marvel Entertainment Group, Inc. . The plan put forward by Toy Biz would result in the merger of Toy Biz and Marvel (other than Marvel's Panini sticker business) with the senior secured lenders of Marvel receiving a combination of cash and common and preferred securities issued by the combined company, together with the proceeds from the sale of Panini. Under the proposal, unsecured creditors and equity holders of Marvel would receive warrants and subscription rights, respectively, in the combined company. As part of the proposed combination, common stockholders of Toy Biz (excluding Marvel) would receive one share of common stock in the combined company for each share of Toy Biz common stock. The cash payments to be made to the Marvel senior secured lenders are proposed to be funded through the issuance of preferred stock and senior notes by the combined company. The proposal by Toy Biz is subject to acceptance by holders of no less than two thirds of the Marvel senior secured debt and bankruptcy court approval. Toy Biz anticipates receiving stockholder approval of the proposal and will seek all regulatory approvals expeditiously. Joseph Ahearn, Toy Biz CEO, stated, "We believe that this proposal represents an opportunity for both Toy Biz stockholders as well as Marvel creditors and stockholders to participate in a meaningful way in a combined Marvel/Toy Biz on terms that we believe should be acceptable to all parties involved." This deal would appear to secure Toy Biz's ability to continue producing Marvel-related action figures and related items. Industry insiders had been holding their breath after Marvel had appeared to reach an agreement with its creditors that did not include Toy Biz, Inc. Toy Biz has had a royalty-free license to produce Marvel character figures and industry insiders speculated about the toy-maker's fate should they part company from Marvel. Pending the approval of this plan, it would seem that Toy Biz will continue to be able to produce these items for the foreseeable future. 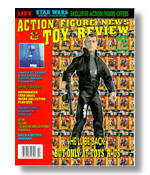 Both Wizard's Toy Fare and Lee's Action Figure News and Toy Review are on the stands now. With radically different styles of covering the toy and action figure world, these two new offerings should have something to appeal to everyone's tastes. 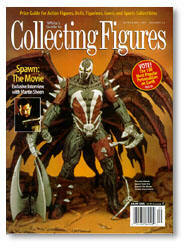 Toy Fare, the newcomer, continues its slick and humorous look at action figures in its fourth issue. With a nifty Borg cover, readers are treated to a peek at the unreleased X-Men: Children of the Atom figures from Toy Biz as well as a hilarious look at a Halloween party at Dr. Doom's crib in the now infamous Twisted Mego Theater. The exclusive figure is Madrox the Multiple Man, but if you want multiples, you'll have to purchase additional magazines. Each order requires an original order form (though you can mail several in one envelope saving you a few cents in postage). Action Figure News and Toy Review gives us a look at the repackaged Toy R Us exclusive Terminator 2: 3D figures including a new 12 inch Arnold and a new 5" figure (possibly from an ill-fated third assortment from the first line). Based on the Universal Studios theme park attraction of the same name, these figures look pretty nifty. 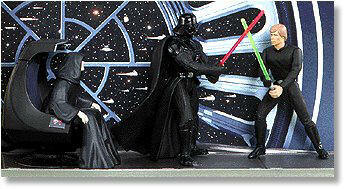 Readers can also check out some unreleased stuff from Kenner's Star Wars Micro Collection Playsets. Mix in an article on creating cool dioramas and a smattering of news and pics from around the toy collecting universe and this new issue should be a good read for interested fans. Pick up both of these issues at your local comic, toy or book store today. Will the Real Jesse Falcon Please Stand Up? Recently, another well known toy-related web spot published a piece allegedly from Toy Biz Product Manager Jesse Falcon. The information reported in that piece didn't jive with what we already know about upcoming Toy Biz offerings so we had a chat with Jesse to get the real scoop. "It's ludicrous!" said Falcon of his alleged Internet debut. "I don't even know how to use the Internet." The only thing in the report that is actually correct is the new assortment of X-men reported here last week (see photos below). Everything else is just "rubbish" according to Falcon. So while he had the chance, Jesse let us in on some specifics of what is actually planned for Toy Biz in the coming months. As previously reported here, new lines for the New Mutants and The Vault are definitely in the works. The Vault is Toy Biz's first all-villain line. "Collector's really seem into villains. We get tons of requests for villains so we developed this line" said Falcon. The downsizing of these assortments is a calculated move on Toy Biz's part. "It allows us to explore a broader range of characters. With a smaller assortment, we can do different things." said Falcon. "Sure, we could do seven figures in The Vault line, but then we wouldn't get to do things like the New Mutants. And the benefit is that if one line takes off with the fans we can be sure to follow it up." The reduced assortments mean less overstock and more chance of retailer re-orders. So all around, this could be a great step forward to getting a broader range of characters from the Marvel Universe into the stores over time. And we got some follow up on the multi-figure set that will follow the Classic X-Men five-pack that should be hitting stores very soon. As we reported in our coverage of the San Diego Comicon, the next set will be "The International Team." Slated for this set are Colossus, Nightcrawler, Banshee, Sunfire, Thunderbird, and Storm in her original costume designed by Dave Cockrum. "It should be ready in about 9-12 months. It's really cool." stated Falcon. The big surprise? As we reported, no Wolverine! Everyone's favorite Canadian mutant will be sitting this one out to let the other team members have their due. "We figured there were enough Wolverine figures out there already. People can use the Water Wars Wolverine as a substitute if they want." said Falcon. Jesse is none too happy to have his identity usurped and used on-line in this fashion. But he's happy to set the record straight to keep collectors and fans informed. We'll keep you updated on things as soon as we can get the news. And very soon, we'll be unveiling the results of our massive Marvel's Most Wanted survey. As you may know, there will be a Toy Biz action figure line called Marvel's Most Wanted (see we told you the name wasn't a coincidence) and even though your favorite might not have gotten the most votes, don't count out some of the underdogs just yet. There are some really cool things planned for debut at Toy Fair International 1998. So stay tuned for all the exciting news and pictures! Well...not really. But Adam Pawlus did announce even more new Star Wars stuff than was unveiled on their site. Among the new offerings are Epic Force asst. #2, including Princess Leia and Stormtrooper, Planets (each planet includes amazing detail, a stand, and opens up to reveal exclusive figure(s) and a scenario ala Galoob's mini heads): Death Star/Meditation Chamber with Darth Vader (removable helmet, different), Hoth/?? with Leia Hoth, Dagobah/?? with Yoda and Dagobah Predator, and more Expanded Universe figures. While not set in stone, there will be about a dozen of these around Fall 1998. Four figures will include Kyle Katarn, Darktrooper, Grand Admiral Thrawn, and Mara Jade. Don't be surprised to get Tales of the Jedi, more Shadows of the Empire, and other figures as well. 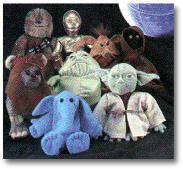 And check out these prototypes of Lak Sivrak (left) and Wicket the Ewok (right). Of course, you would know all this if you already subscribed to Adam's Star Wars Newsletter. So what are you waiting for? Go see other prototypes like Lak Sivrak at Comic Planet, including the Newborn figure from Alien:Resurrection! Warning! Alien:Resurrection has a spoiler that hinges on the appearance of this figure! Go look at your own risk! Bring Me the Head of Fairchild! Wildstorm's first foray into the world of action figures appears to be proceeding apace. 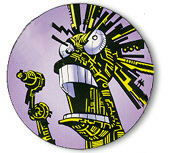 Shown here is a prototype of the head for the forthcoming Fairchild action figure announced here last month. As previously reported, later additions are said to include Freefall, Danger Girl and a character from Jim Lee's new project called Divine Right. Be sure to check in with the Wildstorm web site for the latest developments in what promises to be an exciting line-up of figures. If you look carefully at the product photography found on the back of the new D.U.O. 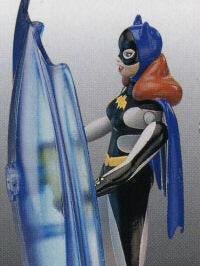 Force Wind Blitz Batgirl, you might notice something a little amusing. There's a slight oversight in quality control. Batgirl's left arm isn't attached to her body! We don't think this is a reflection of Kenner's overall quality, but rather just a funny little glitch that managed to find its way onto the actual packaging. It's amusing all the same. The new Duke Nukem figure by Resaurus is now ready for ordering. And if you snag the Internet exclusive version, you'll be rewarded with a whole mess of goodies. Each Internet exclusive Duke comes with a Duke Nukem figure (duh! ), a special Duke Nukem & Terminal Velocity shareware CD, 1 Devastator weapon, 2 MP5 machine guns, a bloody knife, as well as the hard to find Freeze Thrower weapon. The Freeze Thrower is a very limited production Duke weapon, limited to 44,000 total pieces. The Freeze Thrower will be in every internet version sold, but will be in only 1 out of every 12 units sold in stores. Resaurus also announces that there will be three new figures in Series I: Octabrain, Battlelord and PigCop. 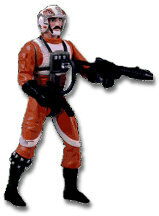 Also look for alternate versions of Duke himself along with variant color schemes and special firing weapons. The Internet exclusive figure costs $12.99 pus $3.50 shipping and handling and will be limited to 36,000 pieces. So get yours now! "Where is it?" Right here. New Star Wars for '98! Hasbro's Web Site has updated their product list for early 1998, and so far it looks like a good year ahead for collectors. As you can see at right, we finally get our Biggs Darklighter figure, albeit one in an X-Wing pilot outfit, not his academy suit. At least it's way better than the Wedge figure. We're giving a brief run down of new products below, but for the whole scoop, including pics of Darth Vader with removable helmet, Ewoks, and Endor Trooper, go to Hasbro's Web page. Princess Leia Organa� All new Likeness! And Star Wars Fighting Figures, whatever they are. Thanks to [email protected] for the heads up. Toy Biz consumer line has reported that Spider-Man: Web Wars is now named Spider-Man: Web Force. The bad news is that Vulture has been dropped from this assortment, as has Cable from the X-Men:Missile Flyers assortment. Other upcoming lines include: Villains from the Vault, the redone Xena line, multiple X-Men and Spider-Man lines, Silver Surfer, Resident Evil, and a few surprises including the New Mutants, and Marvel's Most Wanted. If this last line rings a bell, it's not entirely coincidental. End of the year lines for Spider-Man and X-Men have been announced. Spider-Man Web Flyers is the thematic counterpart to the X-Men Missle Flyers; each figure comes with a flight backpack. 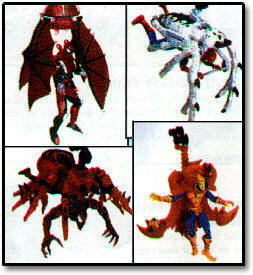 Included are Spider Glider, Web Wings, Carnage and Hobgoblin. X-Men Super Shooters is still following the same basic assortment as the last few X-Men series. Includes Wolverine, Beast, Apocalypse, and Colossus (not shown). 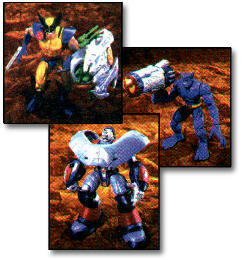 These figures all come with some sort of projectile launcher, and Apocalypse himself is the launcher for five missiles. It also seems the assortment counts have now dropped down to four figures. Look for these toward the end of December. The second Assortment will include R2-D2, Luke Skywalker, Leia Organa. A harbinger of the upcoming Gotham Knights/Detective line of figures newly sculpted in the redesigned Batman/Superman Adventures style, the new Batmobile is a perfect replica of the redesigned vehicle. While the former BTAS Batmobile was great, this one is even neater, and with the increased audience since the last release, don't expect this puppy to be hanging around shelves for long. Expect it to show up at stores around December. Lost in Space, that is. Trendmasters are the folks bringing this movie based line to you by year's end. By the looks of the great design work shown so far, this may just be the line that wipes away some of the ill will left by such misfires as Tarzan and Casper. The pictures may be a little vague, but going from left to right, they show: Judy Robinson, Dr. Smith, Will Robinson's Robot, Spider creature, Jupiter II vehicle, and Big Blue robot. Look for these and other figures, plus role-playing weapons from the film. More new Star Wars prototypes shown at Joe's Toy Page, including previously unannounced figures like Ishi Tib, Zuckuss, Imperial Officer, as well as Rebel Endor Trooper. Other new products hitting shelves soon include the Lil' Penney (Hardaway) dolls from Playmates, Generals Eisenhower and Patton 12" GI Joe figures, Kull movie figures, and more Exclusive Premiere TV toy tie-ins: Beverly Hillbillies, It's a Wonderful Life, Blues Brothers, and George Burns. Lara Croft, star of the popular PC games Tomb Raider and its upcoming sequel, is now all plastic. She's being made into a figure by Toy Biz, as part of their new strategy of branching out from strictly Marvel properties as also seen in the upcoming Resident Evil line. Lara is a resculpted Robot Fighters Jubilee, with leather shorts and holsters to hold her twin 45s. No news on if she's a one-shot or part of a whole line, but we'll tell you as soon as we know for sure. A stunning figure, to say the least. The 14" Galactus figure that was released (and went straight to clearance) in the Fantastic Four line two years ago is being brought back minus the light-up drill, (but with a new paint and deco job) for the upcoming Silver Surfer line. No word on pricing, but expect similar marketing strategies as those that were used before. Kenner apparently wants every toy dollar it can squeeze out of collectors just in case they don't get the Star Wars license past 1997. To this end, they now unveil the Epic Force line, initially including Darth Vader and Luke Skywalker (Bespin Outfit), and Boba Fett and C-3PO. At least these are extremely nicely sculpted figures, kind of like large Action Masters. No definite word on the size, though. We've heard both 5" and 8". More news as it comes. More Marvel's Gold series exclusives have surfaced. This series is a special set of exclusives, controlled by a central distributor, and parcelled out to different outlets. In particular, Neogenesis has received the lion's share of these figures. Coming in December, Troll and Toad Inc. will offer yet another Archangel II (actually Iolas) repaint as the Original Captain Marvel. It will go for a low $11.00, and be limited to 10,000 figures. Another new figure in this "line" is the Vision (in his current incarnation) offered by John's Collectible Toys and Gifts. Like others, this is also limited. And like others, it is once again the popular Archangel II body with a Silver Surfer Head. It also comes with a cloth cape, a feature utilized by three other figures in this series so far, Iron Fist, Marvel Girl, and Moon Knight. You can call John's CTG at (508) 852-0005. The last of these in our mini-showcase is the currently offered, afore-mentioned Moon Knight from Hanger 18. Go and run to their site right now to grab up this puppy, a Hercules body with a Spidey head. Another nifty feature of this series is that they all apparently will come carded on generic Marvel Gold cards. Look for at least one more figure to appear, possibly a certain partner of the already made Iron Fist. Thanks to Brant Rusch for the Vision pic and info. The new Tomarts AFD has been released. This issue highlights many of the Exclusive Premiere dolls, pictures of the POTF coins, and the Blackstar line of the 80's, not to mention the routine shelf reports. Disturbingly, the ad to content ratio is now at about 50%, edging what was formerly the best coverage into Lee's AFNTR territory. But it does have a nice cover photo of a Tatooine diorama made by AFD staffer Mark Cela. The independent figure race is heating up. Bolt throws its hat in the ring with this excellent figure, Widow. 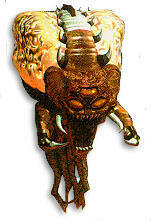 The figure is planned to be over 7 inches tall and with the spider legs attached the figure will be over 10 inches tall! The figure is a hobby/comic store exclusive and is limited to 20,000. As seems to be de rigeur these days, there will be an even more limited variant figure. Widow has 11 points of articulation and the spider legs will be removable. You'll also get a special cyberleg accessory that will interchange with a normal spider leg. This is one of the best independent figures we've seen. Check with your local comic retailer for ordering. Call it Mania, Smash Magazine, or American Entertainment. Whatever you call it, the comic retailer site has taken a step to improve its toy coverage by partnering with Chris Galdieri (charter member of the customize e-mail list, by the way...so join and you can bug Chris about his next update!). Along with some news tidbits, you can now find original content articles on a wide variety of subjects such as the use of the Archangel II body as the base for numerous other figures and a story on figures that should have been. It's just starting to pick up so why not take a peek now? This issue of White's Guide to Collecting Figures features a lot of doll news, a smattering of news, and a variety of articles on any number of collectible topics. However, there are some really entertaining articles here. There is an interview with Spawn's Martin Sheen, several doll articles and features on things ranging from Tamagotchi to limited release figures. The "Tailender" article on Superman the Animated Series is a weak spot in its confusing and sometimes blatantly inaccurate reporting of the end of the Superman: Man of Steel line and the beginning of the Superman the Animated Series line. Of course, there is also the omnipresent price guide. White's is continuing its intriguing "100 Most Popular Personalities on Earth" promotion. In case you're interested, the early vote leaders are Jim Carey, Arnold Schwarzenegger, and Gene Simmons. Since we've had all three of these individuals represented in figural form in one way or another already, one wonders what White's has in mind for its White's World promotion. Only time will tell! The third 3-pack diorama to be announced should hit stores by early 1998. No word yet if this is an exclusive, but seeing as it's available for order through Diamond Distributors, we think it might be a wide release. Thanks to Nigel Percy for the heads-up. Well, Mudman is more like it. But go check out this, the only representation of this seminal character in Spider-Man history, and the other figures that makes up the BJ's exclusive Maximum Clonage 8-pack at our excellent Spider-Man Figure Archive, loving maintained by Mike Fichera. And while there, check out the changes and updates Mike's been laying down. Get the Shaft from Awesome! You won't mind getting this kind of Shaft! Awesome Entertainment has announced that the Youngblood leader, Shaft is the next offering from Awesome Toys. Standing 7" tall with fully poseable arms and legs, the Shaft action figure comes packaged with Battle Sword and bow. A limited edition Shaft variant is being offered as an incentive on the comic book "Awesome's Holiday Special" solicited for December. The Awesome Holiday edition will have a variant paint job and come with an additional weapon in the package. "The sculpting and detail on the Shaft action figure is incredible," said Awesome Entertainment President and CEO Rob Liefeld. "We worked very closely with the sculptors and painters to make absolutely sure that the toy was exactly the way we wanted it. We were thrilled with the reception of the Prophet figure, on sale now, and are very excited about releasing Shaft into the direct market." Following the Shaft action figure, Awesome Toys will be continuing its line of toys by releasing action figures of the Fighting American, Glory and a line of figures based on the Awesome comic Re: Gex. Back to the Main NEWS Page!